Low calorie still raspberry apple flavour spring water drink with vitamins and zinc. With all natural flavours and no artificial colours. Low calorie drink. Offence isn't always the best defence, even if you're an action movie hero. This is the one with vitamin c and zinc to contribute to your immune system and help you be your best. 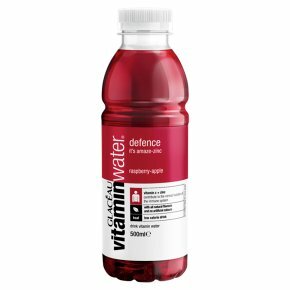 Vitamin and mineral enhanced beverage A low calorie still raspberry-apple flavoured spring water Vitamin c and zinc contribute to the normal function of the immune system All natural flavours No artificial colours Contains Sugars and Sweetener Serve ice cold for maximum refreshment. This bottle contains 500ml, large enough to quench your day-after thirst. Store cool and dry out of direct sunlight Please recycle.